Perfection. Semple has managed to cover some seriously difficult and dark topics (infidelity, mental illness, even my least favorite literary fiction topic ever - suburban ennui) with an amazingly light and humorous touch. I couldn't stop laughing. And I cared so very much about each and every character, even the ones I loved to hate. She does an amazing job of weaving together a very complex story that could have easily lost threads. She also does it in a completely creative way, using emails, phone calls, school documents, etc. to thread together a multitude of characters and motivations. If you've seen Portlandia, you'll already have something of an idea of the Seattle/Microsoft culture that Semple uses Bernadette to so cleverly skewer. Literary fiction (although honestly, I have to say this borderlines literary and popular fiction in my mind) has rarely been so entertaining and hilarious. At the same time, it is so heartfelt and genuine and portrays an amazing mother-daughter relationship. Also perfection. As I said above, the book is absolutely engrossing and entertaining. This could very well be my favorite of 2012. The characters are amazing, the plot is unexpected, and the humor is spot on. I've already mentioned Portlandia, but I also think fans of shows like The Office (early seasons) and Arrested Development will appreciate the satire and black sense of humor. For me, the narrator helped make this book. Her voice reminded me a lot of Joan Cusack's, and she delivers an amazing performance. She made me love Bee and totally revealed her personality in a way that I'm not sure I would have gotten from the book alone. I do plan to also buy this in print and re-read it because I think listening to it may have taken away some from the unique epistolary elements. Buy it, listen to it, download it, whatever, but make sure you consume this book. It will definitely have a place on my top reads of 2012 and may just be my favorite. I really haven't paid this book much attention but I keep seeing it creep up on people's best of the year lists! It does sound good, and if it's like the office in its satire that is always good too! I laughed out loud at your comment about suburban ennui, hehehe. I was trying to decide what to spend an Audible credit on when I saw your review, and it convinced me. I still have a few hours left, but I am loving it! The story and writing are great, and Kathleen Wilhoite is an amazing narrator. I always thought she was a good actress, but I'm surprised that, for someone with such a recognizable voice, her character voices are so varied and distinct. This will probably make my top ten for the year. 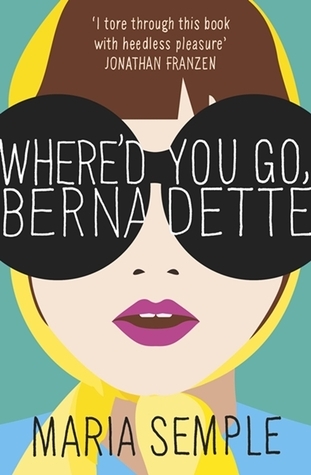 Whered you go, Bernadette was a great read. Its a new twist on the woman trapped in the life of a houswife, with lots of jabs at the suburban private school bake sale mothers as well as Microsoft.